When pondering the great master Bass makers of Venice, Italy, those that come to mind are the master craftsman synonymous with Matteo and Francesco Goffriller, Dominic Busan and Dominic Montagnana. The maker Luigi Chiericato, a much lesser known Venetian crafsman who is not thought of in the same vane, is truly a more contemporary maker and of great importance. Luigi Chiericato was born June 24, 1867 to Ottavio and Margherita, in the town of Montagnana in the Padova district of Italy. Montagnana, being a small village, archived records indicating that at that time, Chiericato had a very early affiliation with his mentor Eugenio Degani, as Degani had established his original shop in Montagnana. It wasn’t until the later part of the 1800’s that Degani relocated to Venice to develop a business clientele in a much more culturally active city. Upon coming of age, in June of 1900, Chiericato chose to relocate to nearby Venice to continue his early affiliation with Degani and his luthier art. His incentive for relocation was based upon the invitation of Eugenio Degani to join his established workshop in Venice. Records show that during this period, Degani took on many workers so that his violin making establishment could greatly expand. It is at this time that Chiericato was somewhat of a transient as records indicate that his living residence changed numerous times. These archives show his last residence was in San Marco at N. 3086 in August of 1924. There is no evidence that Chiericato was ever married and it appears that his career in Venice ended prior to 1931. His work was centered in the Degani shop and he accomplished some outside work at the multiple residences he maintained while in Venice. Most probably he returned to his home town of Montagnana, as records show a lesser degree of work that did continued until he reached the age of 64. It is certain that his return to his home village of Montagnana was to retire until his death of which the date is somewhat ambiguous. It might be asked what makes Luigi Chiericato a maker of notoriety from the Venice school of violin making. Although Chiericato can be considered a contemporary Italian maker, his basses are of fine distinction. They represent a superior quality of workmanship in instruments that far exceed what one would expect the actual age of his basses to be. This fine example of Chiericato’s workmanship is one that truly would be taken to be an eighteenth century Venetian Bass, esthetically and tonally. This bass was one of the four basses which were commissioned and belonged to the historical Venice band. This band was created and formed in or about 1830 and stayed in existence until the musical organization disbanded in approximately 1970. The bass was primarily utilized to perform two or three concerts per week of opera music in the famous San Marco Square for local residents and visitors who came to this magnificent and historic city. It is determined that the orchestra was a primary wind orchestra with the exception of the four basses that performed with the group. This is a Venetian tradition, as the majority of all the bands in Venice incorporated a double bass in the group of players. 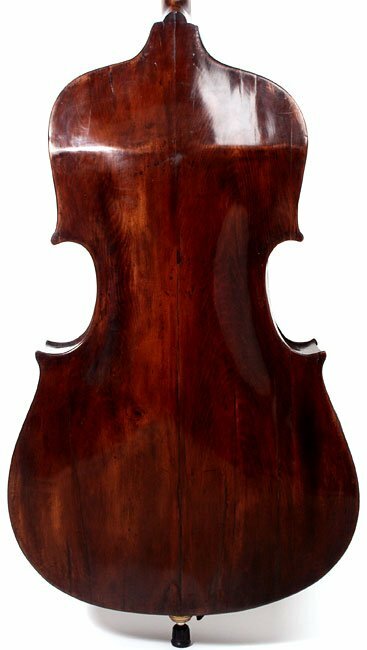 The featured Double Bass was made by Luigi Chiericato, in the shop of Eugenio Degani, Venice, circa, 1885. The instrument bears the makers partially distinguishable label within. 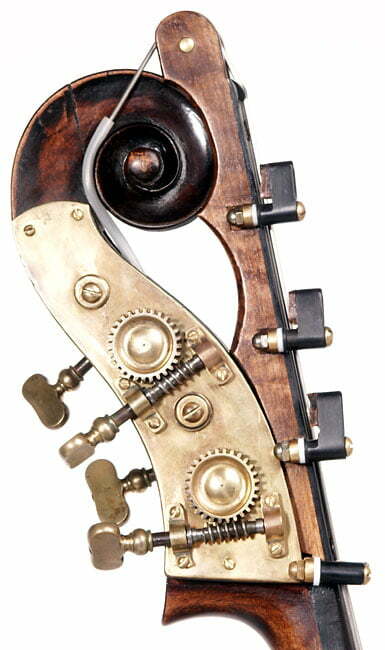 The Chiericato Bass is a modified 7/8 size, violin cornered, swell back model instrument. The top table is a five piece sectional plate ranging in grain from modified slab cut fir at the outer flanks to medium slab cut fir at the center section. The back table is a two-piece sectional plate of slab cut willow with grafted sectioned wings at both the upper and lower right bouts. The back is designed with an interior slotted angle bend in the swell back. This allows for the decrease in the rib height from the upper corner block to a far reduced rib height adjoining the neck block. This design not only makes the bass much more playable in upper register playing, but as well shows a good degree of sophistication in the makers skills in accomplishing a more complex back table design. The ribs of the bass are of matching character slab cut willow to that of the back table. The channeling of both top and back tables are quite well defined and pronounced, particularly in the center sections of both tables, which are quite accentuated in their arch. Purfling on top is inlayed approximately 7 mm from the edge of the table. The back table purfling is scribed, or scored into the back table, perhaps from a later period. Unpurfled or scribe purfling on the back tables was not an uncommon occurrence of Italian calibre basses. The inlayed corner purfling joints on the top table are modified “bee-sting”corners, once again showing the strong hand of this maker. Chiericato’s F-holes are cut in a most distinctive manner and display true quality workmanship. The workmanship demonstrates total continuity of line and fluidity in both f-holes and the overall patina of this fine bass. The scroll is original to the bass, but in my opinion shows the hand of Eugenio Degani. I am of the opinion, that this Bass was made within the Degani shop, and it was not uncommon at that time for the master of the shop to accomplish the more delicate and refined work of scroll carving, even on a Chiericato Bass. This magnificent scroll demonstrates beautifully refined workmanship within the volutes of the scroll and the fluting at the back of the scroll and the rear fluting of the scroll is most distinctive in nature. All these hallmarks translate to the hand of Degani. The gears are individual brass tuners mounted on brass plates. 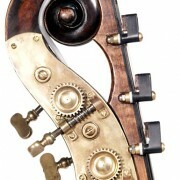 The Bass has a most aged and antiqued reddish brown color varnish. 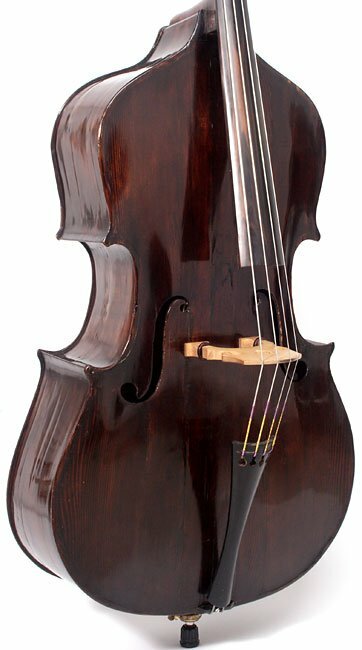 This varnish in conjunction with the nature of aged workmanship by Chiericato, affords the bass an appearance and patina that is associated with basses of extremely high quality and actual aged time and usage, substantially older than the true age of the Bass. This bass was affected by the famous flood of San Marco Plaza in 1966, but was restored in Venice and subsequently restored in my shop in 1999 to a mint state of preservation, both structurally and tonally. This Bass truly epitomizes the quality of the fine workmanship of Luigi Chiericato, and allows him to take his rightful place in the Italian School of fine Bass making. I wish to thank my esteemed colleague, Mr. Stefano Pio of Venice, Italy for his invaluable historic input.